Prime Minister calls Halamish butcher a 'beast' in a Hebrew tweet - but a 'reprehensible person' in English. Prime Minister Binyamin Netanyahu's English language tweet Saturday morning in reaction to the slaying of three family members at their Shabbat meal was quite different from his Hebrew language tweet. On Saturday evening at 8:47 PM, Netanyahu tweeted in Hebrew: "This was an act of terrorism committed by a beast incited by wild hatred." About 40 minutes later, the English language version of the tweet appeared. It read: "This was an act of terrorism committed by a reprehensible person, incited by wild hatred." The unfortunate phrasing was used in a simultaneous Saturday evening press release, and on Netanyahu's Facebook page as well. It was corrected 12 minutes later, but not on Twitter. What can be deduced from this, if anything? The change in form was undoubtedly intentional. 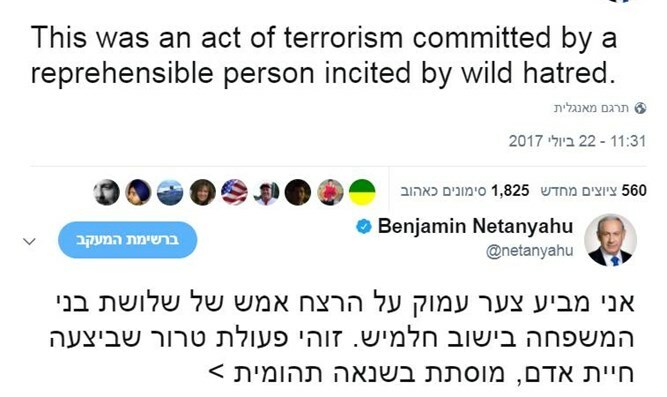 Netanyahu – or whoever phrased the messages published on the Twitter account – must have realized that the Israeli audience expected nothing less than a denunciation of the terrorist that used the strongest terms possible. The world, however, might see terms like "beast" as excessive or even "racist." Therefore, he opted for "reprehensible person". However, we must note, there is a range of English terms that are not quite as harsh as "human animal" and are yet not as tepid and civil as "reprehensible person." Words like "barbaric," "vile," "abominable," "loathsome," "odious," and "repulsive creature" spring to mind. Netanyahu, whose mastery of the English language is famous, could surely have found one of those terms – had he wanted to. It appears that he (or a communications aide tweeting on his behalf) preferred to appear polite and gentlemanly to the world. The weakly phrased denunciation was sent to English-language media by the Government Press Office on Saturday night as well, and attributed to the Prime Minister's Media Adviser. Twelve minutes later, a correction was sent out, and the "reprehensible person" was indeed corrected to read "beast". The Facebook post was corrected, too, but the Twitter post remains without correction.